I had one interesting learning, so thought of sharing this information here. Suppose you need to crawl certain files which are stored in a file system. These files are accessible over http URL through a non-SharePoint application. We had challenges in crawling through URL. The option we looked at was to crawl the file system. 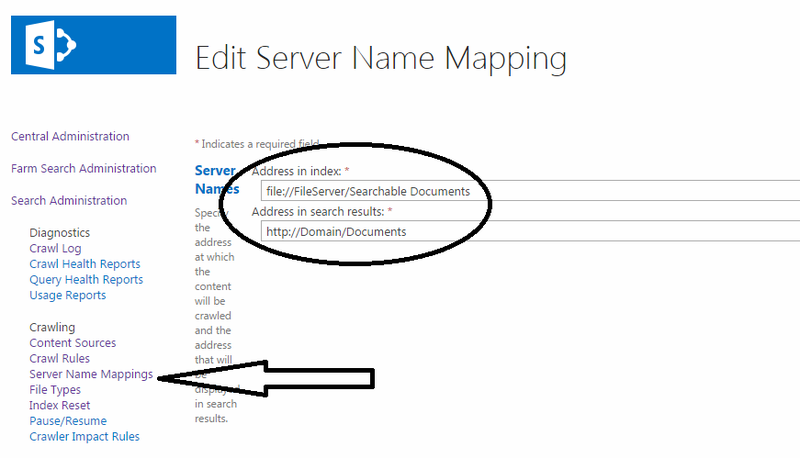 These files were shared and SharePoint search was configured to crawl this location. When we search for a document, it successfully displayed the result as shown below. If you notice, the location is shown as "file" path. The ideal scenario is to replace this path with the URL path which users have access to. This is where Server Name Mapping helped. Navigate to Central Admin -> Manage Service Applications -> Search Application -> Server Name Mappings. As shown below, set the corresponding URL for file path. After you set this, perform a crawl and search for the document. In the search result, it displays the URL which users can navigate to view the file.